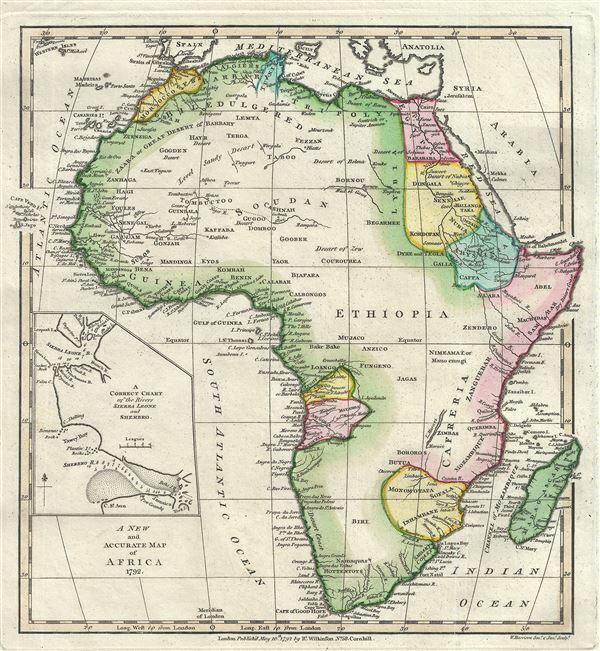 This is a beautiful 1792 map of Africa by Robert Wilkinson. Wilkinson's map covers the entire continent of Africa inclusive of the island of Madagascar and adjacent parts of Europe and Arabia. Africa was as this time only tenuously explored beyond the well mapped coastlines. This map identifies five areas of intensified exploration, the Nile Valley as far as Abyssinia (modern day Ethiopia), the Niger River Valley roughly to Timbuktu (Tombuctoo) and Sudan, the Congo, South Africa, and the gold mining regions of Monomotapa, near modern day Mozambique and Zimbabwe. The interior, though several indigenous kingdoms are noted, is largely speculative or simply left blank. The course of the White Nile is unremarked upon and the Niger River fades away rather than rejoining the Atlantic at the Bight of Biafra. An embryonic Lake Malawi is suggestive of the great African lakes of the Rift Valley yet to be discovered. An inset in the lower left is entitled, 'A Correct Chart of the Rivers of Sierra Leone and Sherrero,' and represents an important shipping port for the African slave and Ivory trade. This map was engraved by W. Harrison Sr. and Jr. and issued as plate no. 41 in the 1792 edition of Robert Wilkinson's General Atlas.